Clare was known for his description of nature and the English countryside as well as his lamentations of his depression and mental instability. His dad was a farm labourer and around the year 1820 Clare had started to write poems in hopes of earning some money to keep his parents from being evicted from their home. His works were published and were highly regarded. He was soon married and had seven children. He struggled between writing poetry and having enough money to keep food on the table. He became depressed and in 1837 went to an asylum for medical care. After 4 years he tried to return home but was confused and ended up going back and remained the rest of his life. 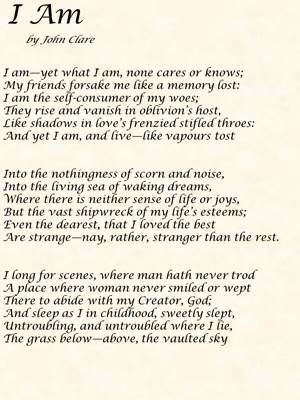 Under the care of his doctor who encouraged him to write, he wrote his most famous poem, "I Am".